These pictures show how many of our designs adapt well for maternity wear. Because they are designed to be flexible for many shapes, they very easily accommodate the new life as well as the mother. Our friend here was eight and a half months pregnant. The bias cut is great for flexibility and the elastic at the waist allows for expansion as well as comfortable movement. Anybody’s tailcoat worn with a slim bias skirt and top in rich purples. 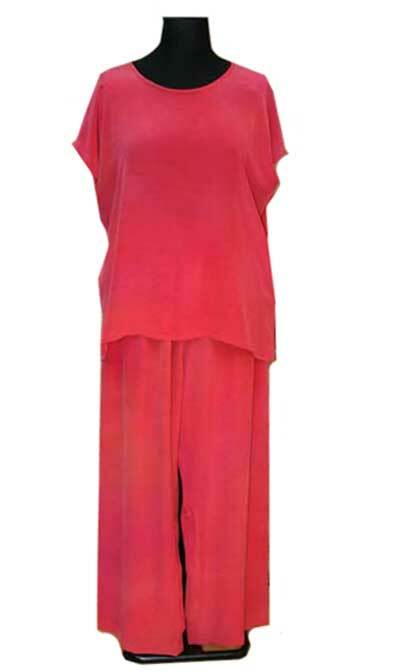 Opera trousers (a bit like a divided skirt) with a tunic top make a simple outfit under the crinkle silk Arthur jacket. The same outfit showing the button necklace made by Georgina. For a sophisticated evening occasion – a deep navy dress – Danuta – in velvet with a rich blue pleated jacket. Another elegant two piece with a stunning pleated jacket in tones of exotic purples. For maternity – the slim bias skirt is best worn back to front to accommodate the bump! Two piece consisting of slim bias skirt (for a thoroughly pregant lady worn back to front to allow for the bump) a simple top and a flowing fine crinkle silk ‘toni’ coat. 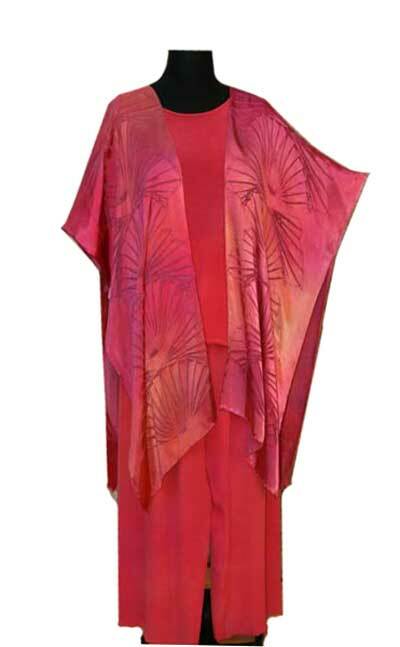 Arthur jacket – fabric: crinkle silk – colour: hand marbled pink, orange, lavender. 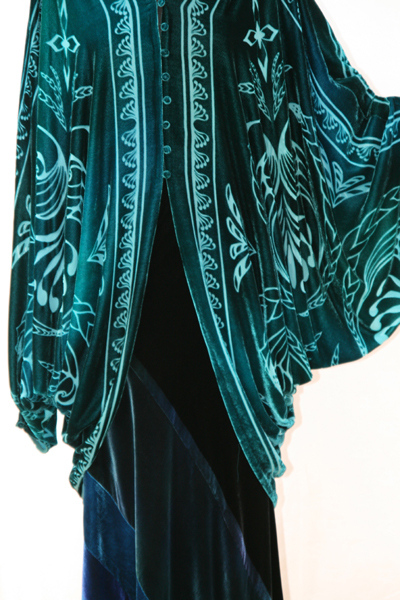 Anybody’s tailcoat – detail – worn with slim bias skirt in patchwork velvet.